My Children’s “Thomaston grandma” or “Mimi” as she would like to be called. 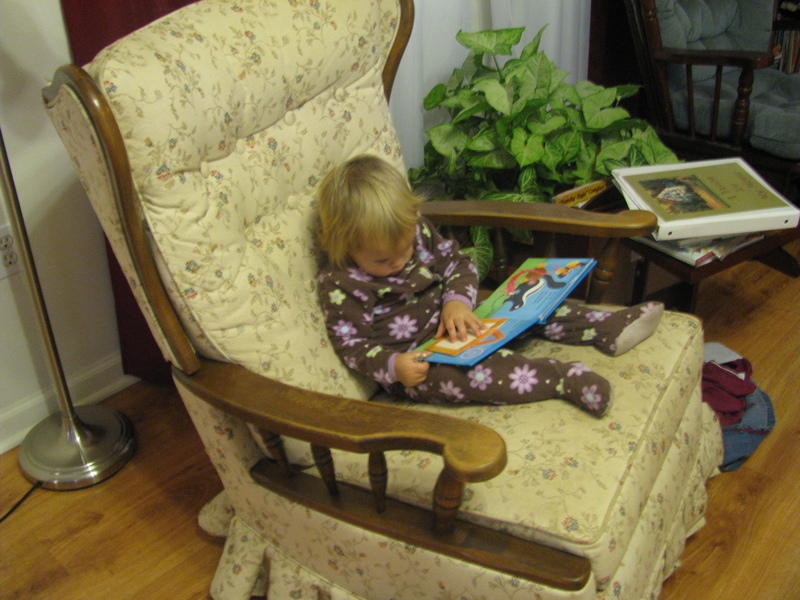 She comes every Wednesday afternoon at 3 to read to my children for 30-45 minutes or do special projects that she wants to do with them. They love it and always look forward to Wednesday afternoons. 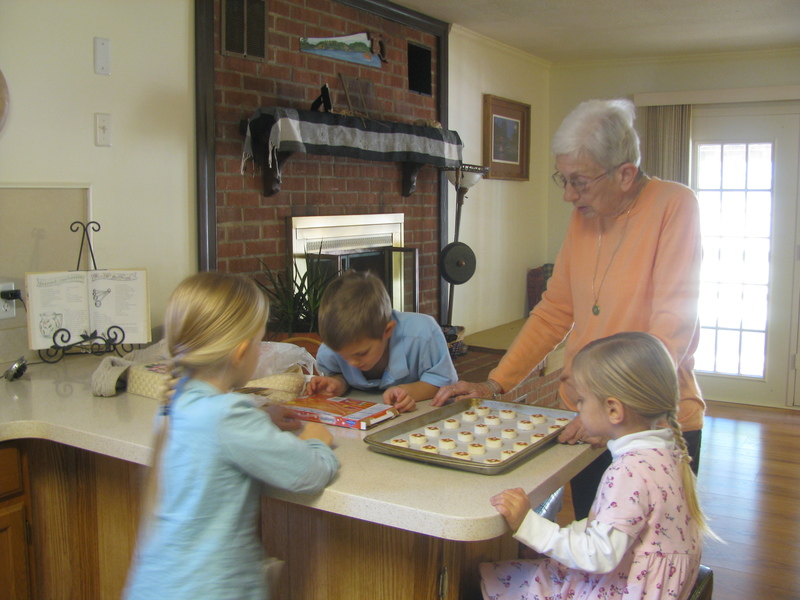 Here she is making Thanksgiving cookies with them. 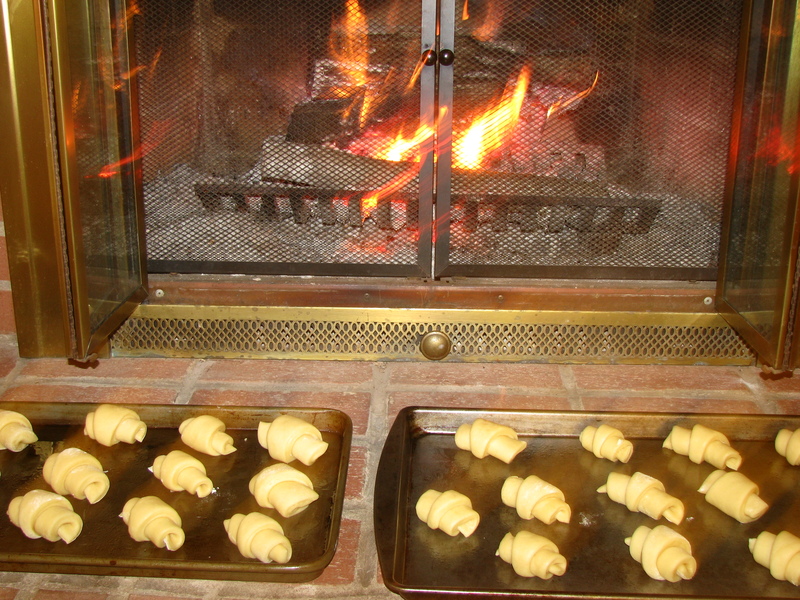 A few cresant rolls raising before the fire for our Thanksgiving lunch with Gary’s. Before Thanksgiving Day we had already had 2 thanksgiving meals, so we didn’t go “all out” on Thanksgiving day, although we did have another wonderful meal. Titus spent the morning helping Gary do some remodeling at their deli and then we ladies took lunch over for them. I took the cresant rolls, candied carrots, and baked corn. Laura and her girls provided the all the other yummy food. 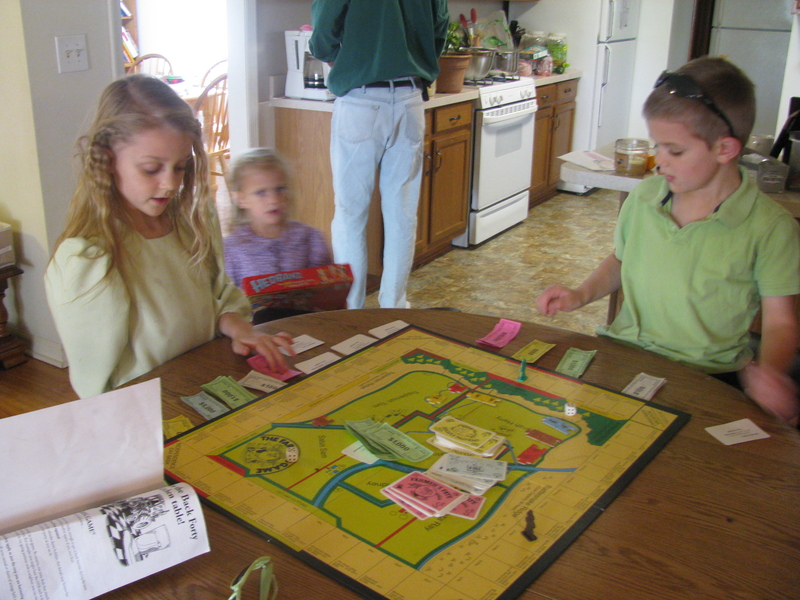 Over Thansgiving week vacation from school, my 2 oldest 8 and almost 7 were introduced to “The Farming Game” and played it for many hours. My son especially thrived on figuring out the money. Cassandra and Andre’ are in the same grade level in school. I never really thought about it that Andre’ was a wiz at math in his school work, but WOW did he ever get a hang of figuring out all the money figures in this game. He learned how to double his hay harvest or cut it in half. He was wiz. It made me happy, happy, happy. We have all those happy memories of a very low key Thanksgiving vacation. THEN: Life hits with a bang through out the night last night and this morning. One of my children complained of a sore throat and by this morning ALL 4 of them have a BAD cough deep in their chests. Hadassah has a fever to go with it. She has occupied the couch all day long so far. I had the three oldest sit under a tent with the warm mist vaporizer with vicks. Thanks, Maria. I have used that so many times already since you gave it to me. Eliana, my dear sweet 16.5 month old has become a terror. Ok, I never did like the saying the “Terrible Twos”. I have always thought that my 2 year olds are soo sweet. They have such cute words and behaviors. They make everyone around them laugh. BUT. 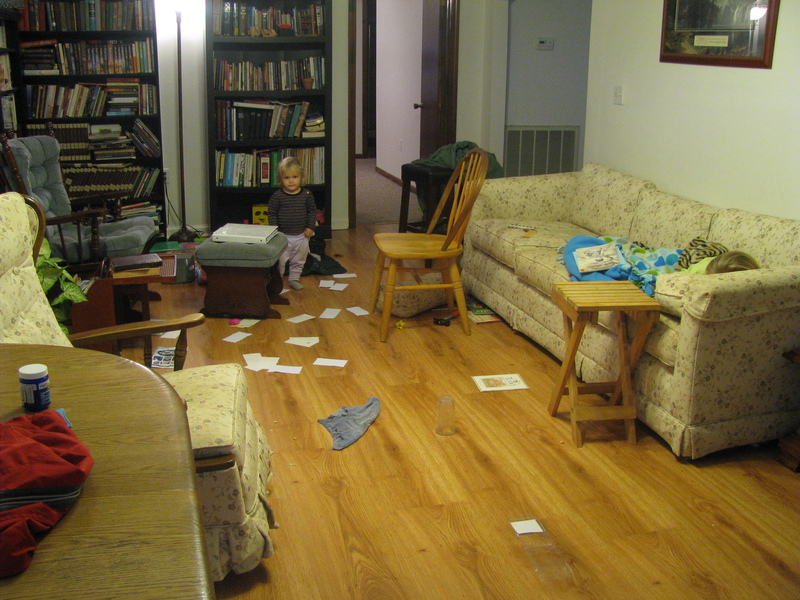 . . from about 14 months – 20 or 22 month old are my dear little ones “Terrible Twos”. They are literally in to EVERY thing. They are still learning what “no” and “come” mean and what obedience is all about. She is still the sweetest thing, but her little fingers are everywhere and into every cupboard, especially those that contain many little pieces. So this morning that was extra busy with sick little ones, plus spending extra time with Cassandra and Andre’ to get them to memorize their addition and subtraction facts, my little one was everywhere. She was happy, but wow what a mess. Enjoy the mess. 🙂 What you can not see, but is there is a big puddle of water between the cup and rag and cracker crumbs all over the floor. That water mess was the third I had to clean up this morning. Dominoes are her newest favorite toy to carry with her everywhere she goes. 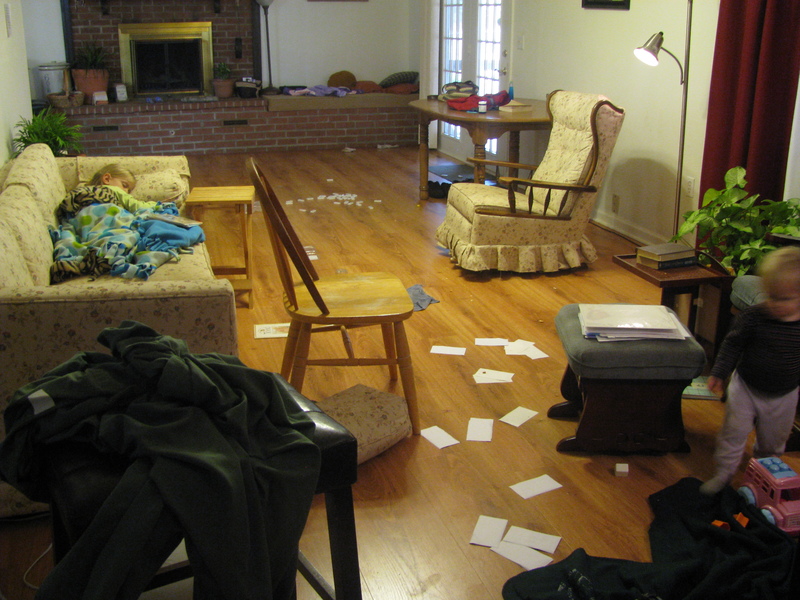 I am finding dominoes in every room of the house. Oh, yeah another thing she was found doing this morning is stirring tissue around in the toilet with her daddy’s razor. Learning to find JOY and to THRIVE even in the midst of these times is an on going process. Thanks so much for a friend that babysat for us last evening, Titus and I were able to go on a date. I feel rejuvenated to keep going. To keep loving my children, to keep thriving right where God has me planted. My prayer is that I can give and give and give some more to my children. To teach and train in the midst of life, to give them the best that I can, and To NEVER GIVE UP, no matter how weary I get. I love having a “grandma” here. She is very sweet. She was an elementary school teacher for, I think, 40 years. Andre’ would love to see Zachary again. I have been thinking about what we could do between your house and mine soon. If it warms up, outside activities wouldn’t be so bad probably. I keep thinking of the zoo and the playground that they have there. oh, I wish, but my children are sick. Two with fevers and the other 2 with deep chest coughs. You are a great mom, and i love how you love your family so well and the extra pains you take to make your home a happy place. Keep on! Thanks, Vicki. We also appreciate soo much the time you took to babysit for us last evening. Yes, it is probably why Eliana was so cuddly. She also did not sleep well at all. I didn’t realize your youngest was only 2 months older than Eliana. E is also constantly on chairs. Hannah, may God bless you in your caring for your dear children. I hope they’re feeling better. I enjoy keeping up with your family this way. Wish I could see you all again! Hi, Amy, I am wondering of the several Amys that I know, which you are? 🙂 Thanks for your comment. I love when my readers comment.